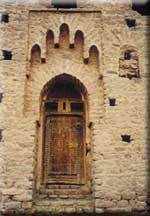 It is in 1860 when was begun the construction of the Kasbah of Glaoua at Télouet, at side of an older Kasbah, the first one having almost completely disappeared. It was increased considerably during half a century in the course of which Glaoua held a prestigious power in the South. Since 1960, The Kasbah is mainly abandoned. It consists of a juxtaposition of buildings - various parts having been added, the Glaoua's fortune and power increasing. 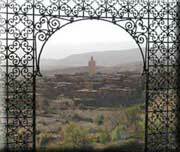 The Kasbah offers an impressive unit, all at the same time fortress, castle and caravanserai. In this composite architecture, the urban elements dispute it with the Berber tradition, but the whole is marked seal of an imposing size. Kasbah, it remains only the part built at the beginning of the XXth century, richly decorated, which testifies to splendour in which the "Last Lord of the Atlas" lived. 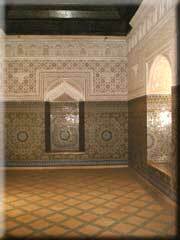 It is said that 300 workmen worked during three years to carve the ceilings and the walls..
We penetrate in the Kasbah by a large reinforced door with a key of some 25 centimeter length to emerge in a stone paved courtyard. 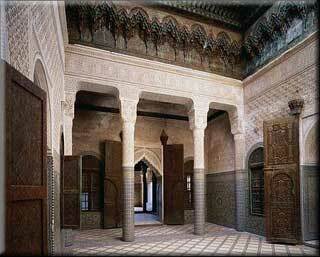 Formerly Berber dances took place under the glance of Glaoua installed in a balcony, in a first floor of the building. The balcony reserved for the favourites is still almost intact. . It is the part of city style that we visit, the one which sheltered the sumptuous family apartments. The reception room gives on the countryside by beautiful latticed windows. A luxurious decoration of stuccos and zelliges hides completely walls and ground. Splendid cedar celling hand-stencilled paint-work. Elegantly slender doors still bears their silver bolts. Splendid sight from the terrace on the surprisingly green countryside which borders the village and the Atlas mountains in the background.